Summer here in the Berkshires has been mostly a wash-out this year, but it has certainly allowed us to spend more time in the kitchen preserving the season's bounty of delicious berries. Blueberries and raspberries are ripe, and local farms are flourishing with these tasty fruits. What better time of year to capture that fresh, just-picked sweetness? 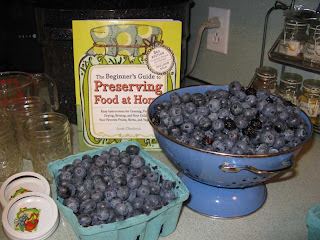 With our new book, The Beginner’s Guide to Preserving Food at Home, at our side, Kristy MacWilliams and I spent a Friday evening in my kitchen making Black Raspberry Blueberry Jam. 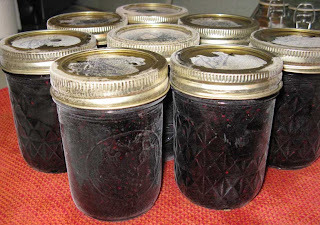 We used the recipe on page 173 – Basic Berry Jam. We used 7 cups blueberries and 2 cups black raspberries. Since we were using mostly blueberries and they have plenty of natural pectin, the only other ingredient we needed was sugar. USEFUL TIP #1: I recommend reading the recipe ahead of time and getting all your materials ready to have on hand. This will eliminate room for error. Wash your jars and lids ahead of time. 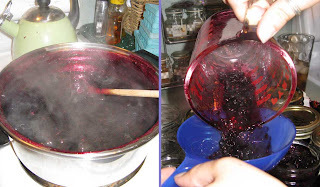 Keep your jars warm by putting them in a pan with 1-2” water on the bottom in an oven set at 200 degrees. Set the lids out to dry on a kitchen towel. Rinse your berries and check for any that may have gone by, or have stems. Those would not be fun to discover on English muffins this winter! Add the berries to a large saucepan. Be sure the pan is big enough that the fruit/sugar mixture doesn’t boil over the sides during the cooking process. We almost had a very big miss on our hands (and my white kitchen cabinets)! Add the sugar to the berries and begin to mash together. You can use a potato masher, or a pastry cutter works well (as seen here). USEFUL TIP #2: Turn on the burner under the canner pot to heat the water and jar rack. You want this water hot, but not boiling, when you are ready to put the filled jam jars in for processing. Also, fill your teapot (or another pan) with extra water and heat it to have on hand just in case there isn’t enough water in the canner to cover the tops of the filled jars. Put the pan containing the berry mixture on the stove over medium to high heat. Be sure to keep stirring the berry mixture throughout the process. It’s not like a pan of spaghetti sauce that you can leave unattended for minutes at a time! The berries will begin to cook down, and the mixture will thicken and come to a rolling boil. This process takes about 40 minutes. The trick to testing its readiness is to drip it from the spoon. If it drips one drip at a time, keep cooking and stirring. You want the mixture to sheet off the spoon, or flow off the spoon in one long strand. You can also test the doneness with a candy thermometer – 220 degrees F is the desired temperature. Once the mixture has reached 220 degrees F and/or sheets off the spoon, remove the pan from heat. Skim off any foam on the top of the mixture and discard. Be sure to wear oven mitts! Take your jar pan out of the oven, and use a canning funnel to help the mixture get into the jars. USEFUL TIP #3: Use a ladle to put the jam into a glass measuring cup. This will help keep the mess minimal when you're transferring the jam into the hot jars. Fill the jars, leaving 1/4” head room. Put lids on, and screw the bands on tightly. Wipe the outsides of the jars if jam has run down the sides. 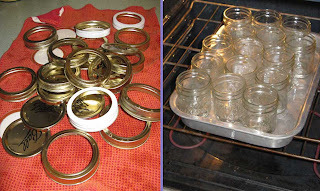 Transfer the jars into the jar rack and lower it into the canner pot of hot water. Once the water returns to a boil, set your timer for 10 minutes. USEFUL TIP #4: Relax, have a glass of wine, this is where the magic happens! When the processing time is up, carefully remove the jars from the water onto a towel on a heat-proof surface. Cool jars overnight. With much consulting of the book along the way, to check the details of the canning process, our result was simply delicious! This is my first blog post since we went live. And I will be writing another post in a couple of weeks, when I revisit my childhood memories of canning in my grandmother’s kitchen. Be sure to check back! This inspires me to try making blueberry jam myself (this post and the delicious sample you brought in). I love the photo of the steaming pot on the stove. I absolutely hate blueberries, but this looks like so much fun that I would do it with strawberries, my favorites. Thanks ladies! I made the strawberry jam first, when Zack and I had picked them. But since the blueberries are more in season, I blogged about the blueberry jam! The strawberry jam is to die for. I have been caught coming from the fridge with a spoonful!